On March 1, 2016, at 1543 eastern standard time, a Piper PA-46-350P, N1982F, was substantially damaged after a nose gear collapse during landing rollout at McKinnon St. Simons Island Airport (SSI), Brunswick, Georgia. The private pilot and two passengers were not injured. Visual meteorological conditions prevailed and an instrument flight rules flight plan was filed for the personal flight operated under the provisions of Title 14 Code of Federal Regulations Part 91. The flight departed from Florida Keys Marathon Airport (MTH), Marathon, Florida, about 1330. The pilot stated that during the first approach to runway 16 at SSI, he performed a go-around due to some conflicting traffic in the airport traffic pattern. During the second approach, he configured the airplane the same as the first approach, with the manifold pressure at 16 inches, landing gear extended, and flaps extended 36° on final approach while trying to maintain an airspeed of 85 to 90 knots. The automated surface observation system was reporting the wind varying between 140° and 190° at 10 knots; however, the pilot observed the wind sock and a flag at that airport and estimated the wind speed as stronger, gusting up to 15 knots. As the airplane approached the runway, the wind gusts appeared stronger and he had difficulty keeping the airplane level. Just prior to touchdown, the pilot felt left-quartering wind gusts, and as the airplane touched down on the main landing gear, the landing appeared to be normal. Then, as the nose gear touched down, he heard a "pop" and then started "losing control of the nose." The nose continued to drop and he applied aft pressure on the control wheel and attempted to maintain directional control until the airplane came to a stop. He then instructed the passengers to evacuate and he performed the emergency procedures for shutdown, then egressed the airplane. The pilot added that there were no preimpact mechanical malfunctions with the airplane and that to the best of his knowledge, the main landing gear remained on the ground after touchdown. Examination of the airplane by a Federal Aviation Administration (FAA) inspector revealed that it had incurred substantial damage during the landing. The area of the nose landing gear bay exhibited crush damage with, the firewall was deformed, the wing leading edges were dented, and the fuselage displayed areas of compression buckling of the top and sides just forward of the windscreen. The nose landing gear assembly was attached on the left side, however the attaching bolt was bent and the right side mounting point was broken and separated from its attachment point. The nose landing gear actuator extended 6.8 inches, which according to the airframe manufacturer, was consistent with extension to the down and locked position. This area of the nose gear assembly displayed gouging and missing material consistent with ground impact. One of the composite propeller blades had separated near the root, and the other two blades exhibited damage at the tips, as well as scraping along the leading edges. Examination of runway 16 revealed scrape marks consistent with propeller strikes along the centerline, about 800 feet from the threshold. There were 15 scrapes in a row, each about 12 inches long, oriented perpendicular to the runway. The row was about 15 feet long. About 2,000 feet down the runway and 20 feet to the right of the centerline, similar propeller scrapes were observed followed by longitudinal scars about 20 feet long, consistent with the color of the cowling in the nose gear area. No marks were observed for the next 150 feet, where the longitudinal scrapes resumed at the runway's right edge and continued another 250 feet to where the airplane came to rest on the paved area along the right side of the runway. According to FAA and maintenance records, the airplane was manufactured in 2012. The airplane's most recent 100 hour inspection was completed on October 14, 2015. At the time of the inspection, the airplane had accumulated 569 total hours of flight time. The recorded wind at SSI, at 1553, was from 150° at 9 knots. 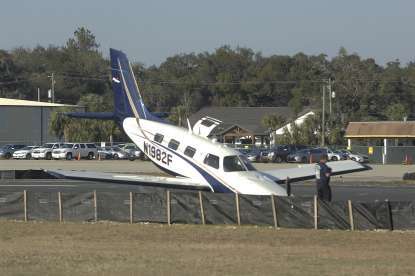 On March 1, 2016, at 1515 eastern standard time, a Piper PA-46-350P, N1982F, was substantially damaged after a nose gear collapse during landing rollout at McKinnon St. Simons Island Airport (SSI), Brunswick, Georgia. The private pilot and two passengers were not injured. Visual meteorological conditions prevailed and an instrument flight rules flight plan was filed for the personal flight operated under the provisions of Title 14 Code of Federal Regulations Part 91. The flight departed from Florida Keys Marathon Airport (MTH), Marathon, Florida, about 1330. The pilot stated that during landing on runway 16 at SSI, as the airplane touched down on the main landing gear, the landing appeared to be normal. Then, as the nose gear touched down, he heard a "pop" and then started "losing control of the nose". As the nose continued to drop, he applied aft pressure on the control wheel and attempted to maintain directional control until the airplane came to a stop. He then instructed the passengers to evacuate, performed the emergency procedures for shutdown, and then egressed. Examination of the airplane by a Federal Aviation Administration (FAA) inspector revealed that it had incurred substantial damage during the landing. The area of the nose landing gear bay exhibited crush damage, the firewall was deformed, the wing leading edges were dented, and the fuselage displayed areas of compression buckling of the top and sides just forward of the windscreen. One propeller blade had separated near the root, and the other two blades exhibited significant damage at the tips, as well as scraping along the leading edges. Examination of runway 16 revealed scrape marks consistent with propeller strikes along the centerline, about 800 feet from the threshold. There were 15 scrapes in a row, each about 12 inches long, oriented transverse (at right angles) to the runway. The row was about 15 feet long. About 2,000 feet down the runway and 20 feet to the right of the centerline, similar propeller scrapes were observed followed by some longitudinal scars about 20 feet long, consistent with the color of the cowling in the nose gear area. No marks were observed for the next 150 feet, where the longitudinal scrapes resumed at the runway's right edge and continued another 250 feet to where the airplane came to rest on the paved area along the right side of the runway. According to FAA and maintenance records, the airplane was manufactured in 2012. The airplane's most recent annual inspection was completed on October 14, 2015. At the time of the inspection, the airplane had accumulated 569 total hours of flight time. The airplane was retained by the NTSB for further examination.